We asked David Sylvester some questions about how learning and development is changing the workplace. David Sylvester: As organizations around the world seek to define what makes a great leader, the conversation around essential qualities has changed a lot. In recent years, researchers have cited a number of broad skills as important—things like business acumen, communication, and problem solving. Although foundational functional and management skills are important, they are table stakes. The qualities that differentiate highly effective leaders, ones who are able to lead in an unprecedented age of accelerations, are more aligned with emotional intelligence—behaviors like self-awareness, self-regulation, listening and acting with empathy, and resilience. Curiosity and bias for action are also extremely important so that leaders are able to quickly recognize and take the initiative to close their own knowledge gaps. Q. How are the experiences of millennials different from other employees? David Sylvester: There certainly has been a great deal of conversation around what it means to have five generations in the workforce. I don’t know that it’s useful to create distinctions by generation that may unintentionally divide rather than unify us. This being said, I agree millennials have a set of life experiences that are different from earlier generations – notably being immersed in technology from an early age. What I believe millennials share in common with the rest of our workforce, is a desire to have meaningful experiences that are aligned with a higher sense of purpose. Q. What are the values and goals that are shared among the five generations currently in the U.S. workforce? Of course, everyone wants a compelling employment value proposition that provides job security and fair compensation. Once these foundational needs are met, intrinsic rewards are what really drive motivation. In his book Drive: The Surprising Truth About What Motivates Us, Dan Pink identified three factors that drive high performance and engagement: autonomy, mastery and purpose. Autonomy doesn’t mean I get to do what I want, when I want. It means I have a voice and choice in how I accomplish my work. Mastery is about the ability to build and apply relevant skills. And Purpose is about every person’s innate need to feel like they are making a contribution to something bigger than themselves. I think everyone—from a twenty-two year old recent college grad, to our experienced hires—wants the same thing. We all want autonomy, mastery and purpose. When Booz Allen says that we empower people to change the world—that applies to all generations. We are a purpose-driven, values-based organization. 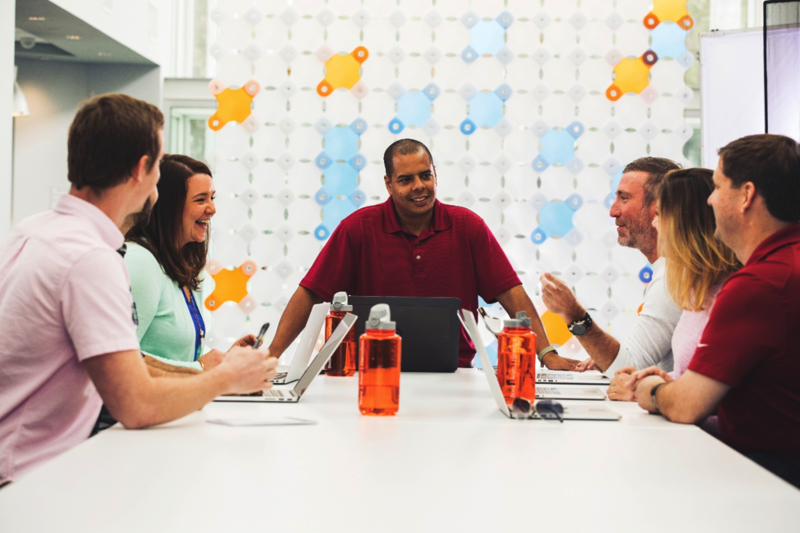 At Booz Allen our people can build relevant skills, have access to opportunities, and feel appreciated for their contributions. Q. How has the approach to corporate learning and development changed over the years? David Sylvester: At Booz Allen, we are currently on a journey to create a culture of learning that inspires people to continuously reinvent themselves, develop relevant skills and contribute to the learning of others. A good way to think about the transformation of corporate learning and development is to look back thirty years at what it was like to buy music. Back in the ‘80s, Tower Records had a ubiquitous, global presence and was THE place to buy music. The stores were huge and featured shelves and shelves full of records. Consumers had a lot to choose from, but had to buy the whole record when they might only want one song. And there were so many options to choose from that it could be hard to find exactly what you wanted. In the late ‘90s and early 2000s, online music sharing sites began to emerge that enabled consumers to buy a single song instead of a whole album via a frictionless, digital user experience. Flash forward to today, and the shelves in our homes that used to host collections of CDs and records are gone: most people don’t buy music anymore. Instead, we subscribe to a service like Pandora or Spotify. These platforms use sophisticated algorithms and machine learning to continually improve our listening experience based on personal preferences. Unfortunately, Tower Records missed the trend and went the way of other media providers like Blockbuster. Q. What do the changes in the way we buy music have to do with learning and development? David Sylvester: We can learn a great deal by exploring the transformation of the music industry. Just like the days when people only wanted to buy a song, I believe people are looking for concise learning at the point of need – learning that is delivered quickly and informally by things like videos, articles and podcasts. The days of a few people in learning and development deciding what’s on a fixed menu for the masses are behind us. Today’s learning and development professionals are making the transition from curriculum managers and instructional designers, to content curators and learning experience architects. We are also tapping into subject matter experts and people across the firm who have a strong desire to create employee generated content. While there remains a role for formal classroom learning and online courses, we have to stay ahead of the trend by rapidly curating a consumer-grade portfolio and creating a user experience that delivers personalized learning on-demand.